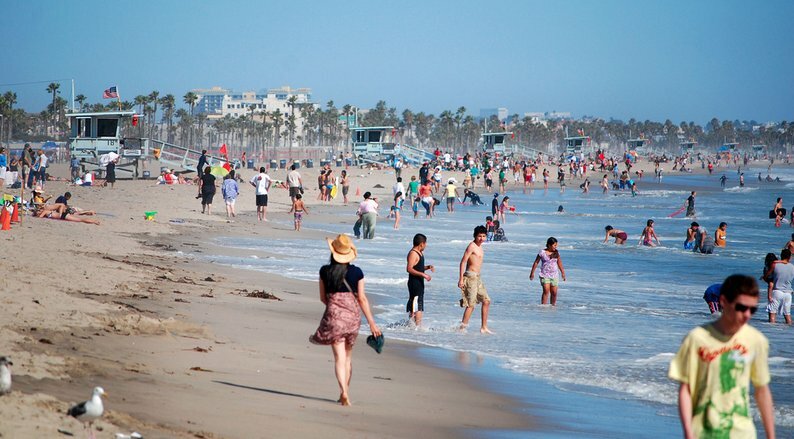 At what point does an L.A. transplant become a full fledged, real-deal angeleno? Is there a quotient of tallied experiences and dispositions whose sum total merits consideration by a special blue-ribbon commission of ‘true angelenos’ who, if sufficiently satisfied, award you a badge signifying your acceptance into this elite club? 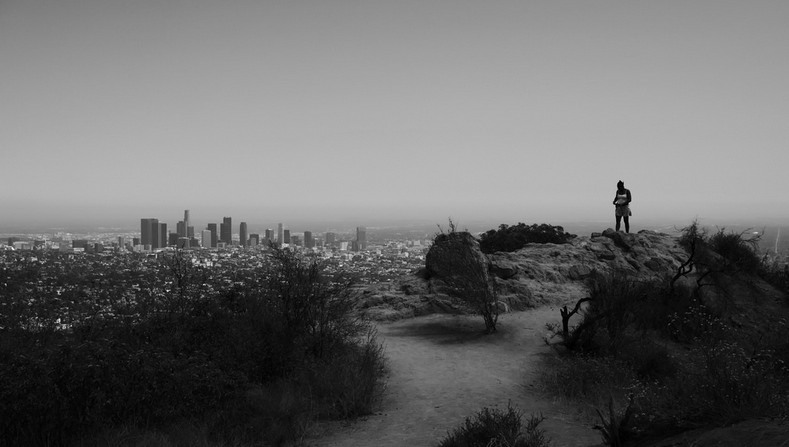 But for any person who moves here from out-of-city or out-of-state, there are subtle (and not s0 subtle) moments along the way when the evolution of an identity inches forward to becoming that of a true angeleno. Humans are extremely adaptable, and one key barometer to demonstrate the extent to which you’ve adapted to Los Angeles is how you perceive traffic. 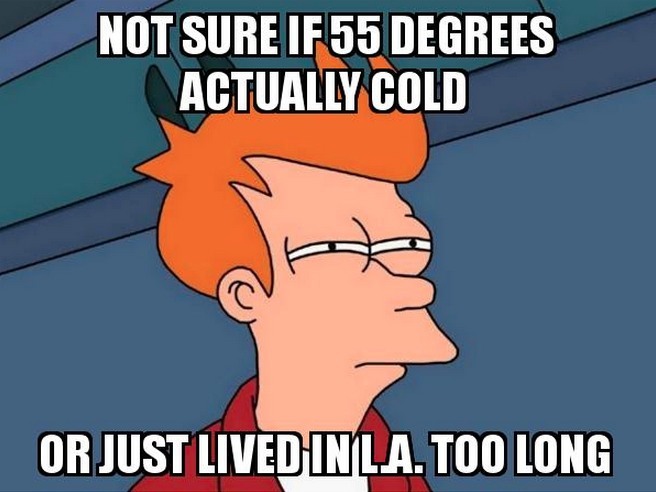 If so, then this is one sign you’re probably a true angeleno. Clearly at some point you’re going to know enough about the city to be worthy of offering an opinion on it. But it’s a huge point of pride when friends, even locals born and raised here, begin to ask YOU for your insight on the happenings, secret spots, and fun to-dos in the area. Basically, if you’re information hub for things to do in L.A. for your social network then chances are you’ve got more true angeleno cred than the average bear. You know that glorious moment when you played hooky from work because the weather was so perfect and you couldn’t resist and you looked at the calendar after you got home and suddenly remembered it was… the middle of January? Of course you know what the flip to side to this little benefit is? Wearing shorts when it’s less than 60 degrees outside is pretty much out the window. And once you’re weather acclimated to living in sunny SoCal, you’ll find you’ll be pulling out the long coat in situations you never dreamed of if you’re from back east. Waze can be a double-edged sword for southland drivers. On the one hand, real-time traffic data is extremely valuable, but on the other, sometimes the app will lead you on what seems like complete wild goose chases. There comes a point where your experience, intuition, and savvy will allow you to override Waze’s recommendations in certain situations, utilizing a backstreet, or staying straight when it wants you to turn, and it’ll actually be faster than treating the Waze directions as gospel. The mastery of this subtle art of knowing when to follow the app and when to trust your gut is definitely a sign of your identity shift to that of true angeleno. There’s always restaurants that have some great off-menu items that only locals seem to know about. Perhaps the most iconic of these would be the In N Out secret menu, but there are surely others scattered throughout L.A. County. The point is that when ordering these items becomes second nature and a matter of habit rather than novelty, you know you’ve advanced in your standing as a true angeleno. It’s not exactly a secret anymore that there a bunch of times where parking in a yellow zone is perfectly legal, but it is surprising to me how many people fail to take advantage of this novel piece of information. That said, the first time you actually take advantage of this novel piece of information to snag a choice spot in Hollywood or downtown, you can’t help but feel a little pride. As laid back (some would say indifferent) as angelenos are perceived to be, I think the vast majority of those who live here are quite proud of their city. If you find yourself jumping up to defend our against accusations of “fake people” or “no culture” or (my personal favorite random insult) “no seasons” then it’s likely you identify yourself as a true angeleno. Donny’s eulogy in the Big Lebowski? Oh yeah, that’s at the Sunken City. Doc’s home in Back to the Future? Right, the Gamble House. The De Niro-Pacino face-off in Heat. That was over at Kate Mantilini in Beverly Hills (now closed, sadly). The thing is when you find yourself instantly recognizing these locations like they’re on the back of your hand, it’s probably fair to say you know a thing or two about Los Angeles. Certainly part of growing up in a city is relating to how the local teams are doing, and learning to take sides. But even transplants can fall in love with a city’s sports franchises, and surely one of the signs that you’ve completely adopted L.A. as your new home is the way you relate to our sports franchises. Does it pain you to watch how awful the Lakers are right now? Were you exalted when the Kings won the Stanley Cup this past year? The fact is when it comes to sports, we all bleed the same color (Dodger blue I believe). Ultimately, as the saying goes, home is where the heart is. And when you give your heart to the city of Los Angeles, you find you won’t want to live anywhere else in the entire world. And that, more than any single thing on this list, defines you as a true angeleno. When did you know that YOU were a true angeleno? Let us know in the comments below!